Donald appears to be recapturing the form that made him one of Europe's best golfers. 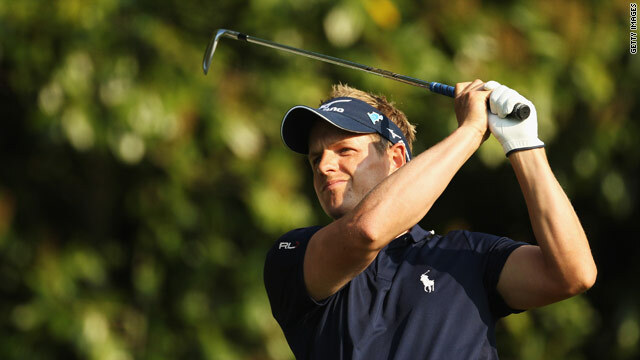 (CNN) -- Luke Donald struck a three-under-par 68 for the second day in a row to lead the European PGA Championship at Wentworth by one stroke at the halfway stage. Donald, who has only carded one bogie in the first two rounds, is six under, one shot clear of his fellow Englishmen Ross Fisher and Danny Willett. Three-time major winner Padraig Harrington and world number eight Paul Casey are a further shot back. Ernie Els, who has been heavily criticized over his redesign of the course, is three under par. Donald, who has been struggling with a wrist injury for two years, reached the turn in three under and was level par for the back nine. "I think the reason why it suits me is because you kind of have to plot your way around a little bit more now," he said. Others found the new course wreaking havoc with their game -- world number six Ian Poulter missed the cut, while Rory McIlroy and Lee Westwood just scraped into the weekend. Westwood was one of the players to express his dismay at Els's alterations to the 18th, which now features a wide stream in front of the green, forcing many players to adopt a more conservative approach. "I preferred the original hole," he said. "I don't think people want to see us lay-up at the 18th." Meanwhile on the PGA Tour, American Cameron Beckman fired a nine-under par 61 to equal the course record at the Byron Nelson Championship in Irving, Texas. Beckman hit nine birdies and needed just 24 putts in his round, which took him to the top of the leaderboard at 10 under par, alongside Blake Adams, midway through the second round. Steve Elkington and Jeff Overton are two shots behind.